Hsu-Min Chiang et al. have an article in The Journal of Autism and Developmental Disorders titled "Factors Associated with Participation in Employment for High School Leavers with Autism." High school leavers with autism from low income families are less likely to participate in employment compared to those from medium and high income families. The odds of participation in employment are 17.37 times larger if a high school leaver with autism is from a high income family compared with low income family, holding other variables constant. This finding suggests that the professionals who work with individuals with autism should be aware of the needs of the individuals with autism from low income families and provide extra support to meet the needs of these students. Because these students may not have the resources, job opportunities, and other supports that the students from high income families may have, the inadequate resources and supports available to students with autism from low income families may unfortunately lead to a low employment rate in this population. Thus, we want to call for more resources and supports (e.g., transportation, vocational training, job coach, job finding) to be provided to individuals with autism from low income families. he latest exponent of Aspergacting is Diane Kruger (best known until now as Helen of Troy). She plays Sonya Cross, the detective in a US series called The Bridge, showing on the pay channel FX. Sonya is modelled on Saga Noren, the detective in a Swedish series called Bron, which showed last year on SBSTwo. The Bridge - Alex Plank Interviews Diane Kruger about Asperger's & Sonya Cross from Alex Plank on Vimeo. Last year Congress directed TRICARE to launch an ABA pilot program to improve and expand its coverage for non-active personnel. TRICARE published its ABA Pilot policy last month for non-active duty family members -- but along with it camesignificant and drastic changes to existing ABA coverage for all beneficiaries with autism, including active duty military families. Last week, TRICARE stepped back, but not away, from this ill-conceived change in the policy for ABA. After a tremendous outcry from military families, service providers, and advocacy organizations, Dr. Jonathan Woodson, assistant secretary of defense for health affairs and director of the TRICARE Management Activity, assured military families that services under the TRICARE Basic program and the Enhanced Access to Autism Services Demonstration (ECHO Autism Demonstration) will not change. As of this writing, however, the new policy itself has not been modified.Our summary here is based on Woodson’s verbal assurances that the ECHO Autism Demonstration and the TRICARE Basic Program will not change. We will update the summary as developments warrant – please check back. PBS is airing a documentary titled "Neurotypical." Just a few days after J. Cole apologized for a lyric about autism that many labeled offensive, Drake has stepped up to do the same. The two collaborated on the latter's "Jodeci Freestyle," with J. Cole rapping the verse in question. J.Cole wrote a beautiful and moving apology to individuals and families affected by autism who were understandably hurt by a verse in "Jodeci Freestyle". I share responsibility and offer my sincerest apologies for the pain this has caused. Individuals with autism have brilliant and creative minds, and their gifts should not be disparaged or discounted. This was a learning lesson for both of us, and I’m grateful for the opportunity to try to right this wrong. J. Cole and I believe that it is the right, responsible, and respectful decision to remove the lyric from the song. J. Cole's divisive lyric -- "I'm artistic, you n----s is autistic, retarded" -- prompted a petition from the Anti-Bullying Alliance prior to the rapper's apology. He is part of a slew of hip-hop stars who have recently backtracked on offensive lyrics, including Lil Wayne and Rick Ross. J. Cole said in his blog-post atonement that he doesn't agree with the trend but felt he overstepped decorum with this particular lyric. The rally was in response to new policies announced by TRICARE imposing restrictions to ABA care under a pilot program for retired and non-active personnel. The policies, which take effect July 25, originally would have applied to all TRICARE coverage, including the ECHO program for active duty members, but was revised after an uproar from military families and members of Congress. Legislation that would have required ABA coverage for all military members passed both houses of Congress last year, but was amended down to the pilot program in conference committee. Similar legislation this year has passed the House and awaits action in the Senate. The Kavas had high hopes in November when Jason became one of 277 Utah children picked in a lottery to receive free applied behavior analysis (ABA) therapy through a Medicaid pilot program. But it took four months for them to complete paperwork, for the state to link families with providers and for Utah Behavior Services to find tutors willing to travel to southeastern Utah. Then the company quit treating J.J. three months later, after his father questioned the quality of its care. The tutors, both formerly stay-at-home-moms with no experience and minimal training, "would drive around town and go to Maverik and buy soda to see how he behaved. That was supposed to be social time," said Jason Kava, a single, working dad. One woman "was hauling him 30 miles to her house, sometimes without notifying us," he said. Except for an initial assessment, none of the sessions was observed by a certified ABA therapist, the Kavas said, and the tutors frequently failed to show up for the 15 hours of weekly therapy J.J. was scheduled to receive. Not all rural families in the program have faced delays and struggles in finding reliable, qualified providers. The Kartchners live in Monticello, a tiny town in the far southeastern corner of Utah near the Navajo Reservation. A board-certified behavior analyst regularly checks in via Skype, providing feedback to his tutor and parents, and tweaking his therapy plan. In five months he has gone from being nonverbal to saying "momma" for the first time, said Kartchner. "He’s requesting things and no longer needs the communication app on his iPod." In rural Utah, said Kartchner, "We have to be realistic. We have this great opportunity, and I’m going to do as much as I can to make it successful." McCarthy is careful to say she is not anti-vaccine on the Generation Rescue website. But she also introduces parents who blame vaccines for causing autism. She doesn’t dispute them. It’s disingenuous at best: She gets to disavow the vaccine connection, while lending her name to a group that promotes it. The accusation has been debunked by science. Seth Mnookin, co-director of MIT’s Graduate Program in Science Writing, recently wrote “The Panic Virus: The True Story Behind the Vaccine-Autism Controversy,” and has reprinted the chapter on Jenny McCarthy’s crusade on his blog. It’s worth reading to get the full sense of her crackpot views of medicine, and the power she wields over parents desperate for answers. The danger in abstaining from vaccines cannot be overstated. This is how we virtually eradicated epidemics such as smallpox and polio. And refusing a vaccination isn’t just a choice for your kid. It’s a dangerous choice for everyone else. When the telltale rash appeared behind Aleshia Jenkins's ears, her grandmother knew exactly what caused it: a decision she'd made 15 years earlier. One of the infected was Ms. Jenkins, whose grandmother, her guardian, hadn't vaccinated her as a young child. "I was afraid of the autism," says the grandmother, Margaret Mugford, 63 years old. "It was in all the papers and on TV." The outbreak presents a cautionary tale about the limits of disease control. Wales is a modern society with access to modern medical care and scientific thought. Yet legions spurned a long-proven vaccine, putting a generation at risk even after scientists debunked Dr. Wakefield's autism research. Before measles vaccine, nearly all children got measles by the time they were 15 years of age. Each year in the United States about 450-500 people died because of measles, 48,000 were hospitalized, 7,000 had seizures, and about 1,000 suffered permanent brain damage or deafness. The Pentagon on Thursday eased some concerns among military families worried that a new pilot program would interrupt treatment for their autistic children. Some active-duty families had feared the 12-month program, which will begin Thursday to provide special behavioral treatment for autistic children, would be unwieldy for service members who change duty assignments. The program requires testing every six months. For “any active-duty family member currently enrolled in the [extended care program], there is no change in their requirements on July 25. They can continue to get the same care under the same rules going forward,” Dr. Jonathan Woodson, assistant defense secretary for health affairs, said during a conference call with reporters. The pilot program focuses on an intensive therapy for autism called applied behavioral analysis, or “ABA” treatment. It was mandated by the 2013 National Defense Authorization Act in order to study how ABA can be made available to military family members under Tricare, the military’s health care system. Military family advocates say the Pentagon previously had issued eligibility restrictions for all members receiving ABA under Tricare, including active-duty family members, but buckled under pressure. “Because of ABA therapy, we had a lot of hope and now I feel like that’s being taken away,” [autism mother Zebonee] Bongiorno said. One of the major issues is the required waiver application if treatment exceeds two years. “Our biggest concern is if there is going to be an interruption in services because we need the continuity,” mother Jennifer Frazier said. “We don’t know what we are going to do. Really, we don’t know,” Bongiorno said. Some lawmakers in our nation’s Capitol have called upon TRICARE to review their new rules. Phone calls to TRICARE officials were not returned. See the Facebook page of Navigation Behavioral Consulting. ... Arzu Forough of Washington Autism Alliance & Advocacy worries that the recent press coverage in Seattle could mislead the public about the nature of autism and obscure how serious the condition can be. Forough supported pulling the ad, and repeatedly calls for various autism groups to work together to advocate for support. But she says the points made by ASAN in many media over the last week are only part of the picture. “A lot of people don’t understand what autism is, they don’t understand that it’s actually a disability,” says Forough, the Eastside mother of an autistic son. “Their perception is that these are individuals who may be quirky and they may just have some minor differences, and they really don’t understand the depth of support that some individuals with autism need. Back at Mary Gates Hall, the members of ASAN say they’ve heard it all before, and stick to their core message: If more thought was put toward accommodating autism rather than fixing it, autistic people would be far better off. One problem was that McCarthy’s hiring was initially categorized as an entertainment story under the journalistic beat system and thus covered by reporters who don’t specialize in science or health. Predictably, some of them resorted to “he said,” “she said” style coverage that failed to make clear just how extreme and scientifically discredited McCarthy’s views are. Maybe, just maybe, Jenny McCarthy won't even mention autism and vaccines from her new perch on The View. That's the hope of Paul Offit, chief of the Division of Infectious Diseases at the Children's Hospital of Philadelphia. "In a more rational world, this discussion would be un-reopenable," Offit says. "The answerable questions have all been answered." It's not the vaccine, or anything in the vaccine. It's not the number or timing of vaccinations. Scientifically, he says, we know that. So what is causing an increase in autism? We don't know for sure, says Offit, but the best data are genetic, involving several genes required for brain development that may generate abnormalities even in the womb. Some researchers have found a connection between older fathers and an increased risk of autism in their children. Or the increase could be due to more awareness of autism and a broader definition of the disorder. One quibble: it is far from certain that there even has been a true increase in the prevalence of autism. Serious analysts agree that changes in diagnostic criteria and public attitudes account for much of the apparent change. It's official: Barbara Walters confirmed on Monday's The View that comedic actress Jenny McCarthy will join the chatfest when its 17th season begins Sept. 9. "We are delighted that Jenny will be joining us as a permanent co-host," Walters says, adding McCarthy "brings us intelligence as well as warmth and humor. She can be serious and outrageous. She has connected with our audience and offers a fresh point of view." Not everybody shared Walters' delight. McCarthy, who has embraced the controversial claim that vaccinations cause autism, has drawn the ire of pro-immunization advocacy groups. I turned the corner and walked into her dressing room. She was getting her makeup done when I said "Hi, Barbara." She whipped her chair around and sternly stared at me with cold eyes. All I could think was "uh-oh." "People think you're crazy, you know that?" she said with words made of icicles. "Um, no," I said softly. Then she lowered her chin and managed to lower an octave in her voice and yet raise the volume at the same time. A July 11 release by Vanderbilt University describes a new study in the journal Autism about a training program to enhance autism spectrum disorder (ASD) identification and assessment within Tennessee community pediatric settings. After participating in training to learn strategies for conducting rapid diagnostic assessments following positive ASD screenings, pediatricians reported significant changes in their screening and consultation practices, with 85 percent reporting an increase in numbers of children with autism evaluated within their practice. The study also found that pediatric providers were nearly as accurate as specialists in their diagnoses, with agreement seen in more than 90 percent of all cases. Community pediatric providers were more likely to conduct independent autism assessments within their practice, rather than referring the child for outside evaluation. Community pediatric providers showed high agreement in ASD classification with expert clinicians. A dramatic shift was seen in pediatric providers’ sense of the appropriateness for a child to receive a diagnosis from his or her primary care provider, without or before a comprehensive evaluation. A dramatic shift in the comfort level of discussing ASD diagnoses with caregivers was seen. There was a significant increase in the number of diagnoses made within respective provider practices. This study builds on pilot findings from 2009 by presenting a more comprehensive evaluation of the training model and utilizing a broader sample of pediatric providers. ANCHORAGE – Today, the Governor signed House Bill 59, creating rapid response and notification plans for law enforcement to activate when a vulnerable adult goes missing. The bill’s protections would apply to senior citizens with dementia, adults with developmental disabilities, veterans suffering from PTSD, and other disabled adults. House Bill 59 was introduced by Representative Max Gruenberg (D-Anchorage). Senator Johnny Ellis (D-Anchorage) cross-sponsored the bill and was the prime sponsor of its Senate companion. “Much like the Amber Alert helps find missing children, the Silver Alert can save lives by coordinating efforts to find seniors and vulnerable adults, should they go missing,” said Representative Gruenberg. The bill received overwhelming support from public, senior, and disability advocates in the Legislature. Silver Alert supporter Michael VanVleet, a disabled Iraq War veteran who works at Ft. Richardson’s Warrior Transition Unit, said it was a much-needed tool to address the problem of veterans with Post-Traumatic Stress Disorder. Alaska now joins thirty-eight other states with “Silver Alerts” or related programs with demonstrated success in improving the outcomes of missing person searches for vulnerable adults. Alaska has a particular need for a “Silver Alert” program, given the state’s harsh weather and vast wilderness, coupled with its large number of active military members and veterans, as well as a growing senior population. The program will be designed by the Alaska Department of Public Safety, in cooperation with the Department of Military and Veterans’ Affairs, to best incorporate the voluntary cooperation of media outlets in notifying the public of missing vulnerable adults through television, radio, and social media. Please call Rep. Gruenberg’s office at 269-0123 with any questions. The recent announcement of new federal rules to the military health insurance program (TRICARE) would put thousands of military children with developmental disabilities such as autism at-risk of losing critical behavioral treatment and care. Today, Senators Kirsten Gillibrand (D-NY), a member of the Senate Armed Services Committee, and Patty Murray (D-WA), a member of the Senate Veterans’ Affairs Committee, expressed their outrage over the new policy which cuts off care for children who do not show progress over a six month period. The new policy reveals a complete lack of understanding of the needs of children with developmental disabilities. The Senators urged the head of TRICARE to explain how the restrictive rules that require standardized testing, limit the eligibility of treatment, and set an age limit on receiving the care were determined and urged the agency to consult with experts before the new rules go into effect on July 25th. The Senators emphasized that children of military families often experience regression due to life events such as deployment, relocation, and new school environment and returning from periods of regression often take significant time and effort. The Senators also requested prompt responses to their list of questions, including on what basis these rules were determined. Autism is the fastest growing developmental disability in the country, with over 23,000 TRICARE beneficiaries diagnosed with autism. Nationwide, this disease affects 1 in 88 children and 1 in 54 boys, according to the Centers for Disease Control. UC Davis MIND Institute researchers have identified the specific antibodies that target fetal brain proteins in the blood of a subset of women whose children are diagnosed with autism. The finding is the first to pinpoint a specific risk factor for a significant subset of autism cases, as well as a biomarker for drug development and early diagnosis. The researchers have named autism related to these antibodies “Maternal Autoantibody-Related," or MAR autism. The study found that the mothers of children with autism were more than 21 times as likely to have the specific MAR antibodies in their systems that reacted with fetal brain proteins, or antigens, than were the mothers of children who did not have autism. In fact, specific combinations of MAR antibodies were not found in the blood of mothers whose children were typically developing. The research, "Autism-specific maternal autoantibodies recognize critical proteins in developing brain," is published online today in Translational Psychiatry, a Nature journal. The study was led by principal investigator and immunologist Judy Van de Water, a researcher affiliated with the MIND Institute. Earlier studies by Van de Water and her colleagues found that women with certain antibodies in their bloodstreams are at greater risk of having a child with autism and that their children exhibited more severe language delays, irritability and self-injurious behaviors than did the autistic children of mothers whose blood did not have the antibodies. To identify the exact antigens targeted by the mothers’ antibodies, Van de Water and her colleagues conducted the research in Northern California using blood samples from 246 mothers of children with autism and of a control group of 149 mothers of children without autism to examine their reactivity with the candidate antigens. Seven antigens were significantly more reactive to the blood of mothers of children with autism than to that of the control mothers. The study found that the mothers with antibodies that reacted with any one of these antigens, either individually or in combination with other antigens, were more than three times as likely to have a child with autism spectrum disorder. Several combinations of antibodies in the blood from mothers of children with autism were not found in the control mothers’ blood. Nearly 23 percent of mothers of children with autism had certain combinations of autoantibodies against the target antigens, compared with less than 1 percent of mothers of children without the disorder. Approximately 1,600 Californians with developmental disabilities reside in and receive medical and other services from one of the California Department of Developmental Services’ (department) developmental centers. Each center develops and maintains policies for identifying and preventing abuse and neglect of residents. Officers from the department’s law enforcement division, the Office of Protective Services (OPS), are on-site at each center and respond to alleged abuse of residents. The California Department of Public Health (Public Health) licenses and certifies the centers as skilled nursing facilities, intermediate care facilities, and general acute health care hospitals. Public Health conducts site visits for required inspections, called surveys, of licensed facilities at each center and investigates complaints involving those facilities. • Health care staff did not always promptly notify OPS staff that an incident had occurred—in seven of 60 health care reviews we examined, staff took from two and a half hours to nine days to notify OPS.  OPS often failed to collect the required evidence during its investigations: OPS did not obtain written declarations from witnesses and the subjects of investigations in 21 cases, did not photograph alleged victims’ injuries in 19 cases, and did not obtain specialized medical examinations for alleged victims of sexual assault in two cases.  OPS completed only 24 investigations (or 50 percent) within 30 days with three taking 292, 436, and 585 days, respectively, to complete. • The same investigator conducted both the criminal and administrative investigations in eight cases, even though a 2002 report by the Office of the Attorney General stated that when an incident has both criminal and administrative implications, two separate investigators should conduct separate investigations. • The department has not addressed longstanding problems, many of which were raised in the 2002 report.  In the last 10 years, the OPS chief has transitioned six times and the commander in each of the developmental centers have transitioned between eight and 10 times.  The department has not provided sufficient specialized training to its law enforcement staff.  Even though OPS has suffered high vacancy rates, the department has no formal recruitment process—in fiscal year 2011-12, OPS had a vacancy rate of 42.8 percent in its law enforcement positions.  Developmental centers have allowed some employees to work excessive amounts of overtime. Sixty-two health care and OPS law enforcement employees doubled their pay during a five-year period–they were paid nearly $14.1 million in overtime pay and $11.4 million in regular pay. • While Public Health has conducted most of the federal certification surveys on time for the developmental centers, it did not complete nearly 60 percent of the required state licensing surveys for fiscal years 2005-06 through 2011-12. • Although Public Health promptly investigated developmental center incidents classified as most serious, we found significant variation in the time it took to initiate investigations for incidents considered to have lower priority. We made recommendations to the department including that it amend policies and procedures for how OPS conducts investigations and that OPS provide the appropriate specialized training to its law enforcement staff. We also recommended that it promptly address OPS’s high number of vacancies, institute a formal recruitment program, and reassess staffing requirements to minimize the need for overtime. Further, to make certain that residents receive an adequate level of care and are protected from harm, the department should monitor closely the overtime approval process, attempt to cap the number of voluntary overtime hours employees can work, and distribute the overtime more evenly among staff. "Autism is a lifelong disability for us to adapt to, not a medical infection to be overcome with some kind of 'cure,'" said Matt Young, an autistic man who wrote a blog drawing attention to the ad. "Please remember this when creating ads that refer to autism, or when speaking publicly about autism. It is not okay to talk about autism as a purely negative thing to be eliminated or wiped out. Remember, when you talk about autism, you're not talking about a faceless, mindless disease, you're talking about autistic people." KIRO Radio host Luke Burbank acknowledges this is a sensitive subject that impacts many people, but he believes work to eradicate autism can still be conducted while supporting those in the autistic community. "It's a little weird to act as if seeking an end to autism is somehow hurtful towards people who currently have autism. I think you can both provide help to, and love, and support, and treat as equals people with autism, and recognize that it is a syndrome that has a very negative impact on the lives of a lot of people." "There are people who grow into adulthood and are completely unable to function in this world, and I think the idea that that's just like, 'Hey, that is just them doing them,' that's their journey. I don't find that argument very convincing." 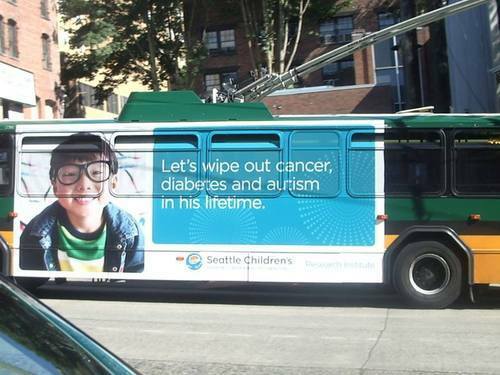 The last item in that tagline — “autism” — is what got these Seattle Children’s ads pulled from King County Metro buses last Friday. The Autistic Self Advocacy Network’s Washington chapter (ASAN-WA) organized an online campaign objecting to the ad’s juxtaposition of autism with illnesses such as cancer and diabetes. Seattle Children’s had received dozens of emails, phone calls and comments on its Facebook page when it decided to nix the bus ads. The Child Study Center at New York University said on Wednesday that it would halt an advertising campaign aimed at raising awareness of children’s mental and neurological disorders after the effort drew a strongly negative reaction. The note about autism, for example, read: “We have your son. 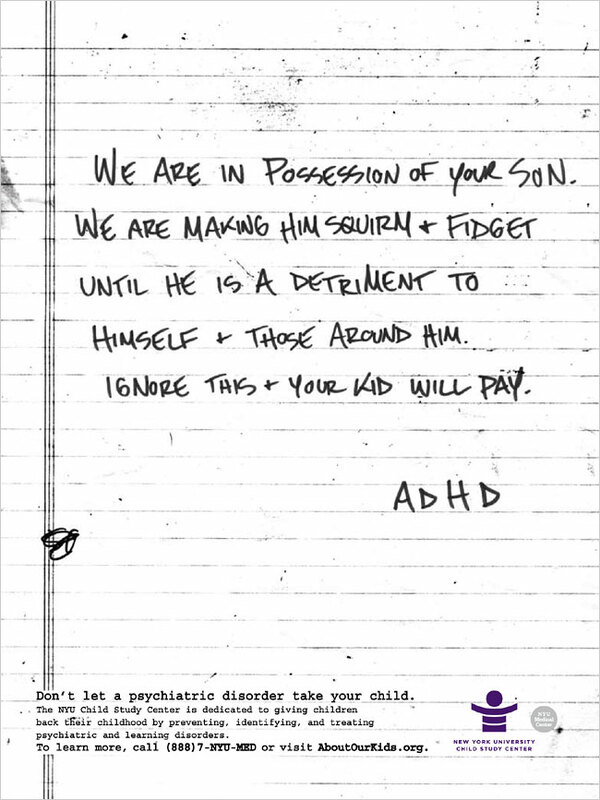 We will make sure he will no longer be able to care for himself or interact socially as long as he lives.”The two-week-old campaign, created pro bono by the advertising agency BBDO, used the device of ransom notes to deliver ominous messages concerning disorders like autism,depression, bulimia and attention-deficit hyperactivity disorder. Advocates for children with autism and for other special-needs children said the ads reinforced negative stereotypes. “While many individuals spoke to us about the need to continue the campaign, inadvertently we offended others,” said Dr. Harold S. Koplewicz, the Child Study Center’s founder and director, who estimated that he had received 3,000 e-mail messages and phone calls. Thirty percent of those praised the initiative, he said, and 70 percent expressed anger and hurt. A number of people with ASD have become murder victims. At Babble, Joslyn Gray writes of Alex Spourdalakis, a 14-year-old ASD boy who died at the hands of his mother and godmother. I don’t. I don’t feel pity. Just the rage. I don’t understand this as desperation, because when you’re desperate, you take the help that is offered. Both the National Council on Disability (NCD) and the Autistic Self-Advocacy Network (ASAN) have called for the U.S. Department of Justice to investigate Alex’s murder as a hate crime under the Matthew Shepard and James Byrd Jr. Hate Crimes Prevention Act of 2009. “On Sunday, 14-year-old Alex Spourdalakis was found stabbed to death in his suburban Chicago home. Alex was severely affected with autism and his mother and his caregiver have been charged in his death.